During the month of July we had the company of Sally Coffey. A former editor of a well respected travel magazine, she has recently gone freelance and we were delighted to welcome her aboard. 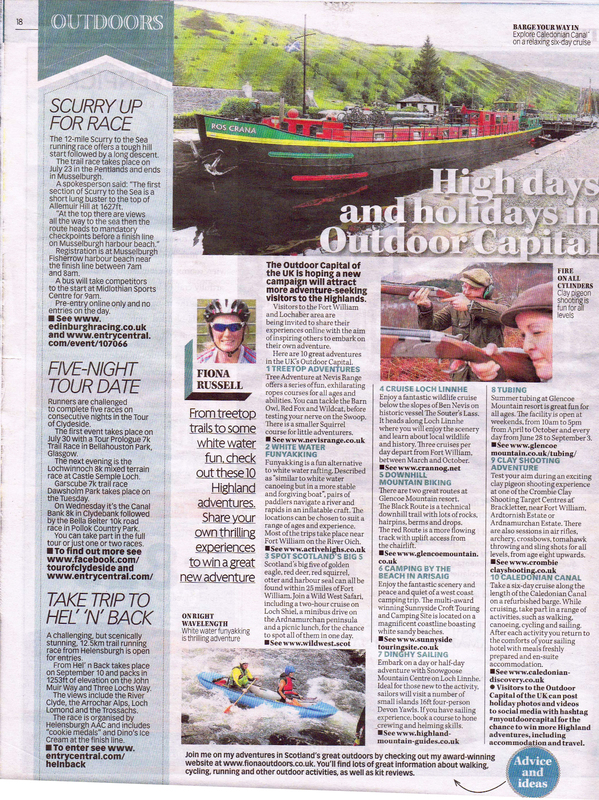 She has recently published this article on the Britain Magazine website, where the peace, tranquillity and history of the glen left an impression on her, along with the ease at which you can explore the Great Glen, using our barges as a wonderful floating home. Recently we had the company of Andrea McVeigh who in her amusing article revealed a few facts we like to keep secret! There is even a quote from the Loch Ness monster in the shared photographs . At the start of the season Inka Quiegsa Pischotte joined us for a few days from Foyers to Banavie, Fort William. Her article Wowed by Inverness, Scotland & the Highlands – by Water! of her time in the Highlands including time aboard Ros Crana is included in this article from Iberia Airlines Jet2Fly web. In the early part of the summer 2016 we were joined by the BBC radio programme “Out of Doors”. Hosted by Mark Stephen and Euan McIlwraith, who were exploring the Caledonian Canal. Part of their journey was aboard our barge Ros Crana. The BBC have kindly allowed us to use recordings from this programme. They are divided into these sections. Our sincere thanks to the BBC and the Out of Doors team for allowing us to use these recordings. During the summer of 2016 we had the pleasurable company of the journalist Mark Whitley. 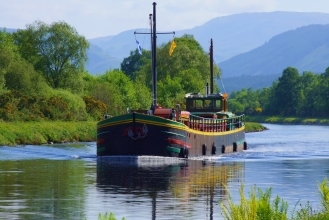 In his gentle article “Exploring the Great Glen” he offers an informative history of the Caledonian Canal, the Great Glen, the walking options available and the joy of experiencing the glen while travelling with Caledonian Discovery. Mark is the editor of the Countryman magazine. Last year we were joined by Susanne on an October Cruise. In October 2016 she tweeted saying how much she enjoyed her trip, one year after the experience, as it was still fresh in her mind. Her fine blog is here. Earlier this year (2016) we had the company of Katherine and Romeo Belarmino. They write a warm and enlightening travel blog titled “Travel the World”. Since their departure they have written some informative, friendly articles, on their experience aboard Ros Crana. The first is attached here for your perusal. We hope you enjoy the article which also has a pictorial video of their stay with a clear sighting of “Nessie”!